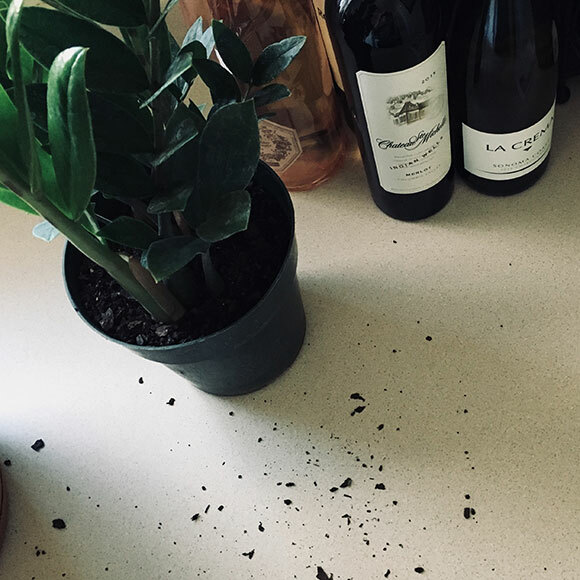 Soil has spilled all over my kitchen floor. It happened while I was dumping another withered plant—this time, a sad collard green—from its pot into the trash. The mess, and the funeral, is for a good cause though. Today, I bravely enter new territory: My neighborhood garden center, where I will adopt my first, fledgling plant family. You might remember my pledge to become a better plant parent from the first post in this series. Now, my adventure begins. My new plant family. Aww. For moral (and horticultural) support, I’ve asked Wade Wheatley to be my fearless guide. Wheatley, the Garden’s tropical greenhouse horticulturist, knows a thing or two about indoor plants. His love for all things botanical began back in fourth grade, when his grandmother gifted him a clipping of one of her many houseplants. When the clipping grew into its own plant, “It blew my fourth-grade mind,” he said. Now, Wheatley has—count them—almost 70 houseplants. He even keeps an Excel spreadsheet to track the Latin name of each plant, where it came from, its parentage, care preferences, and age. An Excel spreadsheet, you guys. This man is not messing around. With help from Wheatley, I plan a crew of tropical plants that would do well in my small studio. Most houseplants are native to tropical or subtropical habitats where temperatures remain above freezing, which means they can survive year-round in our warm homes. My apartment is hardly freezing (the overactive radiators make sure of that) and I have two windowsills—an east-facing one with bright, direct light, and a west-facing one with low, indirect light. I also have a cat who, although she cannot be bothered with houseplants, I don’t want to accidentally poison. Meet ZZ, the poster child of starter plants. “ZZ plants can handle dryness if you forget to water them, and are unbothered by low light levels (though bright is better),” said Wheatley. A good rule of thumb is, if you think you should water ZZ, wait a day, and then wait three more days. This guy likes it dry, so I’ll plan to put him in my west-facing window. “Praying” this plant makes it. I really like it in this spot. Known for its variegated foliage, or funky leaf patterns, the prayer plant’s leaves move. At night, the leaves respond to the dark by gradually turning up, then folding back down during the day. Plus, they’re easy to care for. 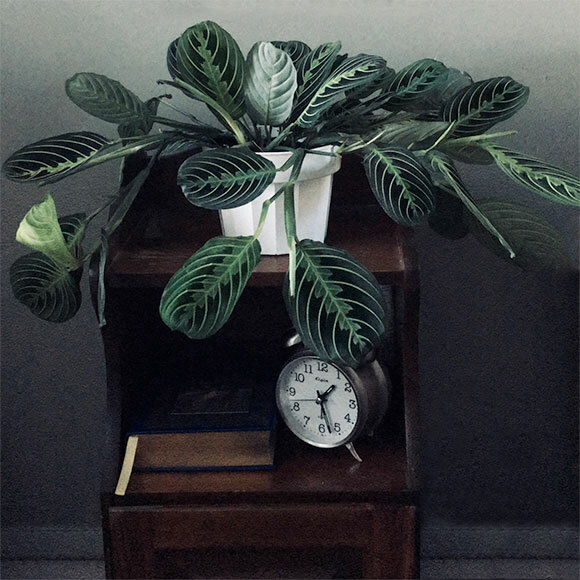 “The prayer plant can handle it pretty dark, but likes even soil moisture,” said Wheatley. When the top ½ inch of soil feels dry, I’ll give it a drink. Spider plant’s runners can be cut and replanted very easily. Arachnophobes, fear not. 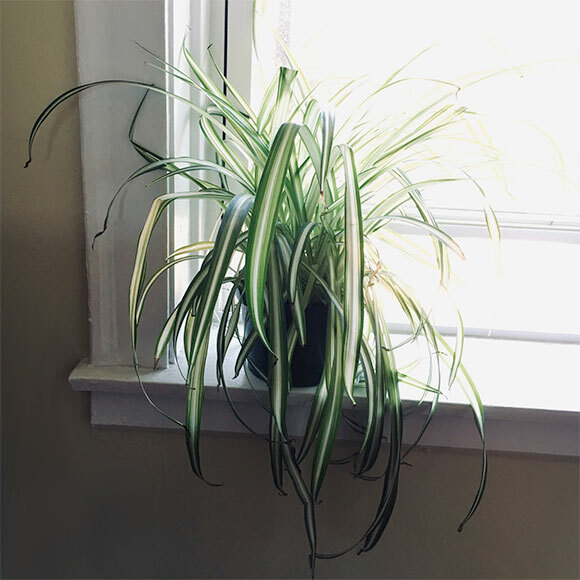 Spider plants are easy to grow and do well without much water. “Spider plants can go a little drier, and make a fun hanging basket if you let its runners spill over the side of the pot,” said Wheatley. Never mind that they look like spiders dangling by a thread above your head. Just go to sleep. I love this aloe’s gorgeous bloom. Though I was a little afraid the coral flowers make for a good cat toy, Wheatley told me not to worry. “Aloe isn’t poisonous, should your cat find it tasty,” he said. “It requires a lot of light, but it’s very drought tolerant.” Read: Aloes love neglect. 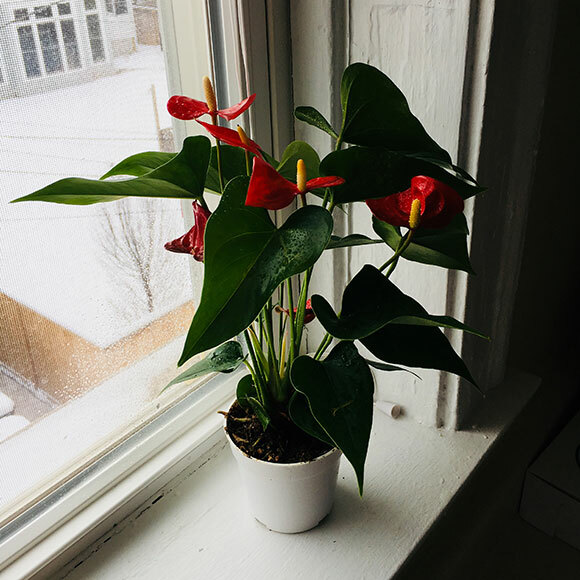 Flamingo flower & east-facing window: check! An easy way to add color to your home, anthuriums bloom bold red and pink flowers. “Anthuriums are generally problem-free and easy to grow. They can handle a wide range of light but would probably do best in a bright, east-facing window,” said Wheatley. So. Fuzzy. 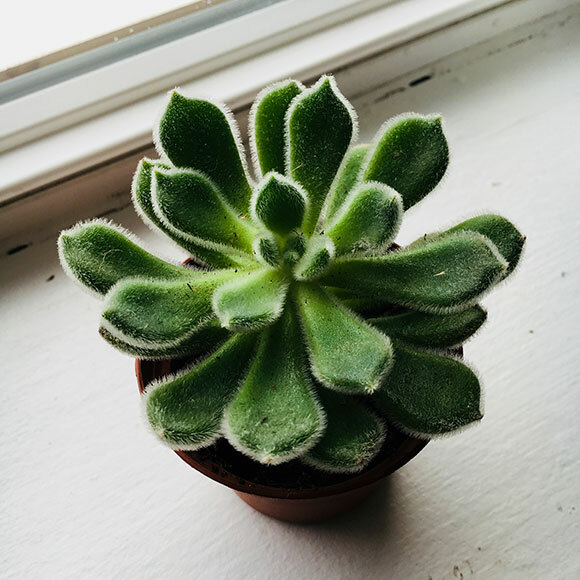 In love with this succulent already. Succulents can be deceivingly tricky to care for. They thrive on dryness, so most people kill them by over-watering. This is another one for my bright, east-facing window sill. Armed with Wheatley’s advice, I push open the greenhouse door at my local plant center, and my glasses fog up. Water trickles into a nearby koi fish pond, and birds chirp softly in a cage. I unwrap my scarf. An employee spots me wiping my lenses and asks, “Do you need help?” My plant blindness is showing—literally. The employee points me to an aisle of easy-to-care-for, relatively-indestructible, can’t-possibly-mess-this-up plants. People go about their work around me, tending to the shelves of anthuriums, cacti, and orchids. They seem to have a peaceful glow to them, and I wonder how long it’ll be until I’m gliding around my own apartment, watering my plants in a blissed-out state. Science says nature makes us happier, after all. It’s only a matter of time. Follow along with Plant Parenthood as I track the success of my starter plant family. After assembling my plant gang, I ask Wheatley if there was anything else I should grab. Do I need pots? (No. You should only repot a plant after at least one year.) Do I need plant food? (Sure! General all-purpose fertilizers will do the trick. Just follow the instructions.) Seems easy enough. I grab my bag of plants, and turn to go. ….Erica…..ditch the vino and concentrate on the botanics, just sayin! OK, Erica….perhaps “enhance” with the vino…..gotcha! because its scientific name was Zamioculcas zamiifolia. Hope all your plants live and bloom for you. I’ll be reading to find out. Thanks, Katherine! Learning the scientific and common names is an adventure in itself. Some of them are pretty wild. I just returned from a week-long trip, so I was nervous to abandon “the kids” so early on. Luckily I had some plant-sitters on hand, and most of the plants are still kickin’ it. 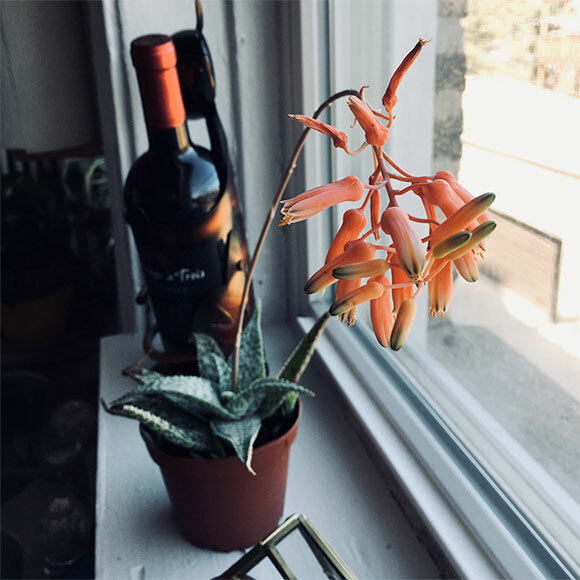 My aloe lost all its flowers, though, and the succulent is losing some leaves, which makes me sad. I’m not sure what’s going on, but I think water is the culprit—I’m going to ask the horticulturists here for advice. I’ll report back!